Set up charges are $60 (V) per logo, per decoration method. No set up charge when decorating ribbon with text only. See Decoration Information for further details. Indulge the coffee lover with a gourmet gift that features half a pound of sought-after Peet's Coffee Blends including French Roast, Colombia, & House Blend. 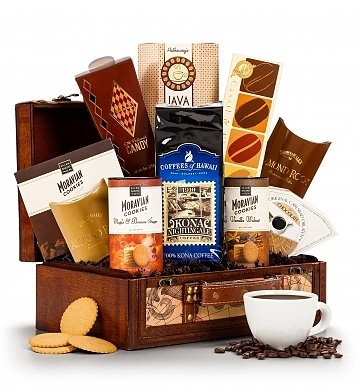 Traditional coffee-themed treats accompany each fine coffee including Mocha Shortbread, Dolcetto Gourmet Wafers, Java Candies, Cappuccino Jelly Beans, and eight more specialty foods. Each premium selection is expertly arranged by hand in a deluxe map-themed attache with solid wood construction, an antique old world map design, leather handle, sturdy brass rivets, secure lid and elegant brass clasps - a treasured keepsake intended for practical use long after the original contents have been enjoyed. Altogether it's the perfect gift for the coffee lover in your life. Peet's Coffee: Colombia, French Roast & House Blend. Biscoffee Shortbreads: Cappuccino, Mocha & Espresso. Peet's Coffee: The original artisan coffee pioneers, Peet's Coffee is tirelessly dedicated to superior quality with small batches, fresh beans, and rich and complex tasting notes in all their famous blends. Items are presented in a beautiful map-themed chest. Measures 12" x 8" x 5".